One thing (among MANY things) that I like about BBC’s Sherlock is that the method of how the story is told is, in and of itself, given a twenty-first century upgrade, namely, in the world of blogging. In the original novels by Sir Arthur Conan Doyle, the stories were told from Dr. John Watson’s point-of-view. 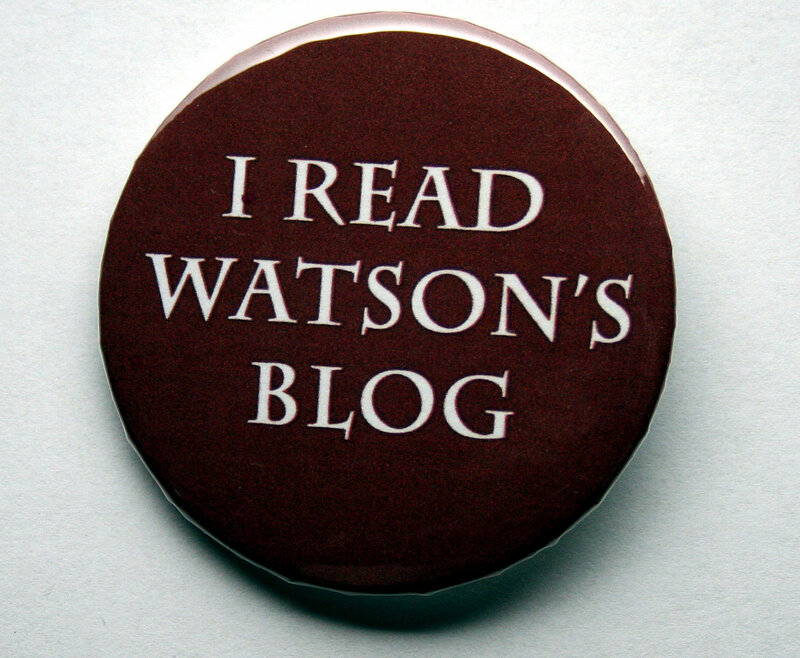 In this modernized version, Watson again has the role of story-teller, this time via blog. In the first episode of Season One, “A Study in Pink”, Watson’s therapist is trying to get him to blog about his experiences fighting in Afghanistan as an army doctor and solider, in order to cope with his return to civilian life, but it isn’t until Sherlock comes into the picture and Watson starts solving mysteries with him that he’s actually found something to write about. It’s true, in the program, Sherlock has his own website, “The Science of Deduction”, but it’s Watson’s blog posts detailing their exploits through the adventure of crime-and-mystery-solving that gets to be the more popular for readers. Both actually work together in order to bring them more and more clients (though whether Sherlock’s willing to take them on is another matter entirely). Now of course, most people reading this now are probably familiar, if not totally well-aware, of the concept of blogging, and all that entails and encompasses. But I thought it was interesting to think about, as far as the upgrading they do in Sherlock, the fact that it includes a story-telling device, from Watson’s point-of-view, that’s been given the “modernity treatment” (in addition to Sherlock’s texting (which he prefers to actually talking on the phone) to cracking passcodes to get to top-secret information on camera phones to the nicotine patches he wears in place of the iconic smoking pipe). And who knows? Somewhat harkening to older forms of literature, as in Goethe’s novel, The Sorrows of Young Werther, or Frances Burney’s Evelina, where the novel’s contents consists entirely of letters written between different characters involved in the story, there are now “cell phone novels”, which are originally written entirely via text message. Similarly, out there there’s such a thing as a “blovel”,which is a novel serialized in blog posts–but what about a novel written entirely in the form of blog posts, one after the other threading together a story? This also (to me) would harken back to that old custom of the epistolary novel (a style which also included novels written entirely out of newspaper clippings and other documents strung together to tell a story). I’ve not heard of one specifically that’s been published, but if there is one, or one in the works, I wouldn’t be surprised. It’s somehow fitting, quaint and clever, all in one, that for the upgrade given to Conan Doyle’s famous detective and the narrative world he inherited. Watson always narrated the novels because that way the reader would be surprised alongside him whenever Sherlock made another one of his clever leaps of the mind that no one else seemed capable of making. In the modern world, Watson would definitely go and blog about it. 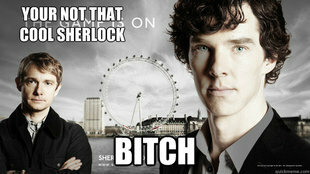 Especially when it sometimes, amusingly enough, annoys the hell out of Sherlock. But it does make me wonder: now that we’ve made a marriage of literature and technology with cell phone novels and “blovels”, where is the next stage on the evolution chart of story-telling? Novels written entirely out of comments on blog posts (and articles and the like). There are probably those who may think that now is the pinnacle of everything we could hope to achieve in certain aspects of human life, such as in the age of books, that it can’t possibly evolve any further. But that’s only for a lack of imagination. There’s always an age that believes itself to have reached the peak of civilization, and history has shown them to be wrong. So I again, I wonder, what is next in world of story-telling? I think it’s at least safe to say that technology is definitely paving the way, and that’s why BBC’s Sherlock works so well as a reimagining of the Conan Doyle novels. It’s a commentary on a simultaneous nostalgia for the past and eagerness for the future, all coming together very smartly indeed. Next Post It’s Okay to Make Up Words!